I'm going to clear out this journal and stop crossposting but still keep the account for reading. I bought a membership to Worldcon 2017 when they first became available, but I wasn't sure whether I'd be able to actually go. This is not a blog about finances, but it would misleading not to acknowledge that it imposes choices. I went through a very sudden, very expensive move in October-November 2016, and wasn't sure whether I felt Worldcon was still worth it after the dust (and the books) settled from that. I was still waffling until last week when a close friend, who is not generally given to Acts of Carpe Diem, announced that he was going to climb freaking Kilimanjaro next month. I've never been one to give in to peer pressure, but that was a challenge I couldn't entirely ignore. Also, I've been feeling a bit in a rut lately, and this was a kick that I needed. So I made some spreadsheets and then decided to go for it. Aside from the excitement and opportunities of Worldcon, I just want to see Helsinki! I also have very probably unrealistic dreams of doing some light hiking with my DSLR in tow. I still haven't decided how many days I'll go for--in any case I can't be there the entire time, my employer beckons--but I'm full of excitement and plans. Which is, if you will permit the cheesiness, my absolute favorite state of mind. Efficient people: move to Colorado, buy Subaru, bike everywhere. Me: move to Colorado, try not to wipe out in Camry, live too far to bike to work so drive everywhere, give up. Leave Colorado for Maryland, buy a Subaru, bike everywhere. And the day after purchasing the car, I ordered some wool socks and merino leggings. Spousal Unit: What are you going to do, turn on the a/c in the Subaru while wearing them? Now, because I have a very poor sense of direction, the household joke/diagnosis is that I live in my own personal TARDIS. I usually only get lost in space, but you could argue that in this instance, I've once again* gotten lost in time and I was actually buying all these things two years ago in Colorado, when they would have been much more useful. * So there was also the incident when we were trying to go to a Moscow museum of classical art and I somehow navigated us to a modern art museum. Artistic satire in the form of a Stalinist-era golden toilet stall is really something, let me tell you. I don't believe in New Year's Resolutions for their own sake. But the convergence of history and religion, at least in the U.S. where I live, has resulted in a nice string of vacation days leading up to the otherwise arbitrary event. And so around every New Year I an given a break from work, resulting in enough time to breathe and take stock of my life. Usually this results in a few days of wallowing in all my failures of the year, followed by a few days of vowing to do better and scrambling to put systems in place to do so. This year was no exception, and my brain fixated on my fiction writing, which I didn't work on as much as I would have liked in 2016. The reasons aren't all bad. Some of it was failure and procrastination and laziness. But I also burned the candle at both ends successfully developing my career in writing non-fiction. That job keeps my family fed and sheltered and warm, and I'm also pretty fond of it for its own sake. So I'm happy and proud of what I've accomplished in that arena. Still, we all only have so many Action Points in a day. If nothing else, 2016 taught me to honor my limits. And I had to admit that I simply didn't have the resources to spend as much time grinding at my fiction tech tree*. And that was okay. Everything builds on everything else, and what I did accomplish is not a waste. It's only a waste if I forget what it's all pointing towards. So in 2017, my goal is to rekindle that love, commit to finishing more stories whether or not I submit them for publication, and in general rebuild the foundation (of love, and squee, and passions both dark and light) that drive me to tell stories. *If it wasn't already obvious, I view life as a mostly frustrating RPG. This will be interesting because I am petite (5'3") as well as--not to put too fine a point on it--not a cylinder. So customization is mandatory in all sweater patterns. I had previously sworn up and down I was only going to do top down raglans in the future because it's SO EASY to adjust the most troublesome measurement areas for me. Also because seaming is the worst. So really, what I did last night shows that I had completely taken leave of my senses. XD However, the pattern very thoughtfully provides line drawings with all the measurements for all the sizes, so hopefully I should be able to mix and match? Thank you, Dianna Walla, for being so considerate of non-fit-model figures. 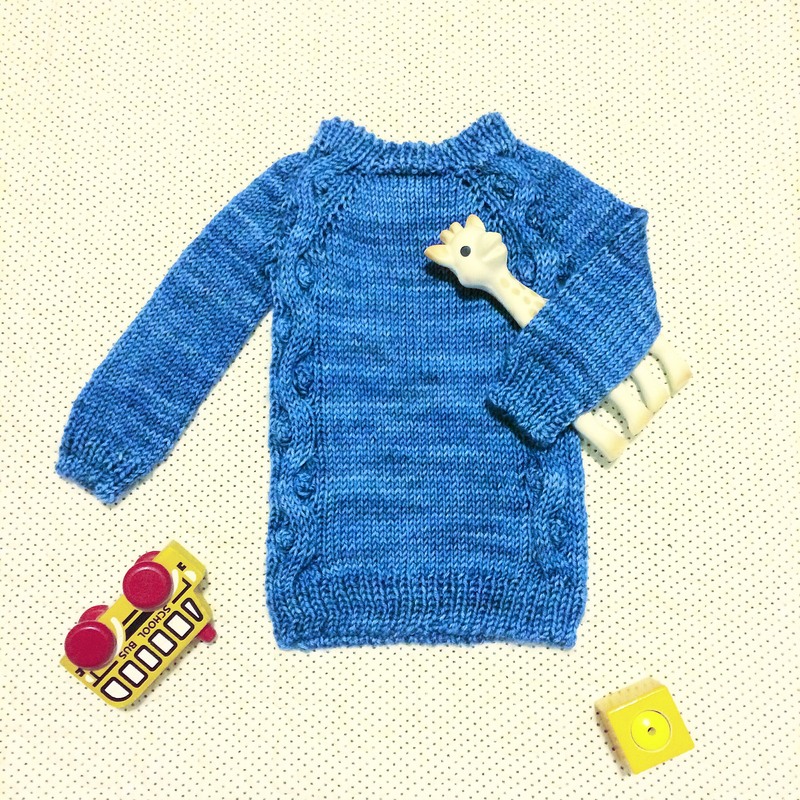 For any knitters who may be reading this: I made the 1 year old size with a lot of adjustments. The yarn was Dream In Color Classy (worsted) in the blue sulk colorway, which is obviously very different from my photo—I think they changed it though, because my yarn does not look like that at all, even allowing for lighting/monitor differences. Anyway, you can find the details on my Ravelry page. IFTTT comments seem to be borked? I have a couple of blogs scattered all around, and I decided it's time to consolidate them. For a long time I didn't want to; I preferred to silo all my interests. But you know what ... I don't really mind or care anymore. I am as much writer as knitter as fashion enthusiast as (terrible) photographer as (better) cook, etc etc etc. So from now on, I'm going to ... let it hang out, I suppose? IFTTT is pretty good for this sort of thing but it doesn't have a Dreamwidth module, and I still want to maintain my DW blog, so it'll have to start from there via RSS feed and post to WordPress. The only irritation is that it doesn't transfer tags, so that's something I will still have to manually update, but it's better than nothing. DW can also automatically crosspost to LJ, which is nice. Anyway, this is the first post testing IFTTT functionality, so pardon my dust, etc. Much to do ahead as I tweak the WordPress.